This is a picture of my copy of Founders at Work: Stories of Startups’ Early Days . It has broken my record for the “book with most stickies.” My system is that the stickies on the top edge are ideas for my next book, and the ones on the side are ideas for this blog. As you can see, it’s a gold mine for great stories about entrepreneurship. Here is a list of some of my favorites. The major lesson: Entrepreneurship is all about tactics, hootspah, not knowing that things are not done “this way,” and making do with not enough money. You’ll LOL at points and wonder if a better title would not have been Flounders at Work. These are just a few nuggets. The whole mine is what you should get. Thanks for this recommendation, Guy! As I relentlessly code away day and night, it’s healthy to be reminded of the fact that others have been (and are) in similar situations. I love what The Woz had to say in #2. How true! 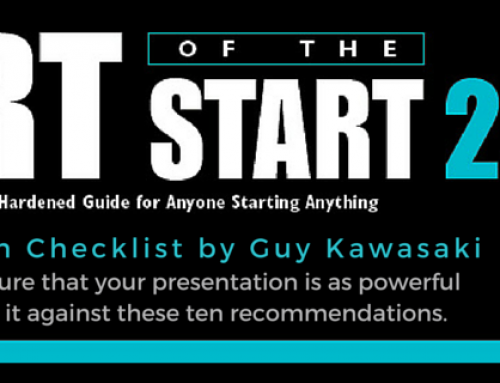 Guy Kawasaki rounds up some useful quotes from tech founders…. Excellent post Guy! I always love hearing about fellow entrepreneurs and how they got started. Looks like another good book to add to my list to read…thanks! I read the book from front to back. Haha, the Yahoo diesel generator story is great… I wonder how many pages per gallon they were actually getting… If it were to happen today, what type of energy source would they would use? There might be a new industry niche: solar powered servers. Great stories the sacrifices that entrepreneurs go through to bring an idea to the marketplace is humbling and inspiring. I just received my copy from Amazon today and was about to start reading it. Thanks for pointing out the best of the book. This book is pretty encouraging, especially when working day and night on building something that we have so much passion for. Currently I am working on building a Social Marketplace http://www.onista.com and I really want to find time to read this book completely to keep myself going. Got it the day it came out, read it days, brilliant book, simply brilliant. I think the best profile is probably Paul Graham’s. But there all really good. Evan Williams showed amazing persistence there with blogger. Why not Odeo? i was lucky enough to take a company from 0 to a public offering back in web 1.0 days. besides the thrill of kicking the s*&% out of your bigger competitors, the really great part was the young kids that you got to mentor. You did it without even knowing it. It is so fun to run into someone on linkedin or other system and see where they are now and what they have accomplished. the pleasure in knowing that in some small way you helped make them a (hopefully) better person, or more creative, or probably more confident in their abilities. Other than watching your own children, there is probably no better high in the world. that is what being an entrepreneur is all about. Founders at Work – Sold! There isn’t a lot I could say about this book that hasn’t been said better already. It’s just a great collection of insight from people who made their vision happen. Totally inspirational. 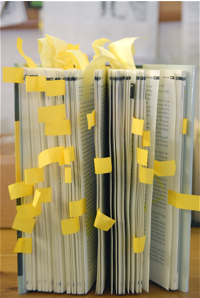 What I can recommend though is, if you’re looking for a better alternative to a litter of sticky notes, try Book Darts. Scott Berkun recommended them on his blog a while back and I have to agree, they’re perfect for marking all the passages in my books. It’s also enlightening (and a relief for some) that a few started out saying “right, let’s just start a company” but with no initial thoughts on direction, let alone a first-draft product idea. Geeks + Sunlight? Are you sure that’s a winning combination? This is a must read but will it open our eyes to how the equity structure of each company evolved over the funding rounds? I talked today with a guy developing a social software site. He has raised lots of cash and said he wished he had read my guide first. Now I guess he will say “I wish I had read this book first!”. So many people in the Cambridge Cluster, UK, want to do it a new way and not learn from others. It makes the entrepreneurial world rich and fun but sometimes people get hurt for a little bit of knowledge. Guy, I’m also reading the book and in the middle of it. It’s extremely captivating and as an entrepreneur myself, I am sure learning a lot! I think what Mike Lazaridis (RIM) means by “signs on the back of the building” and on how that attracts students, it helps to know that the back of RIM campus borders on the University of Waterloo. The signs out front facing the main entrances are smaller than the sign on the rear of the building facing the students. The only other book that I’ve saw in that condition is “Disclosing New Worlds: Entrepreneurship, Democratic Action and the Cultivation of Solidarity”, from Charles Spinosa, Fernando Flores and Hubert L. Dreyfus. Sounds like a great book. It often seems as though successful people have some ‘special powers’ that mere mortals don’t. But, as these quotes show- all it takes is perseverance and the courage to take a few risks. Everyone starts small. Great recommendation, Guy. Next time you need a Yiddish speaking editor, though. Hootspah sounds like a place you go in Scottsdale where you spend all day laughing. I think you meant Chutzpah, which is what most of the featured folks in the book probably had plenty of! JibberJobber came from that – from my need, and the needs that I saw others had with job search, personal relationship management, stuff like that. And since we are all supposed to change jobs every 3 – 5 years… I found my better mousetrap. Stories like these help keep me going – thanks for posting the snippets from the book! btw…there was a John Scull at Apple, wasn’t there? There was a John Scull at Apple. He was “Mr. Desktop Publishing.” The person who commented about the book losing credibility is actually wrong. Jessica is right: It was John Scull, not John Sculley, who did the dtp evangelism. James is a great guy. Jessica’s book is fantastic. Great post … off to Amazon to put it on my reading list. Thanks! I like this post and will buy the book once I get the chance. I choose this as the post of the day! As always, a cool post by Guy. 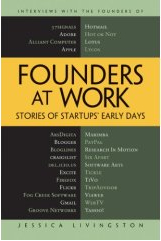 Will most certainly read “Founders at Work”…sounds interesting. For those looking for other books along the same lines as “Founders At Work”, check out “100 Great Businesses and the Minds Behind Them” (2006). I highly recommend the audio book version. It’s both entertaining and insightful. Enjoy. I also saw “Forbes Greatest Business Stories of All Time” when buying “100 Great Businesses and the Minds Behind Them” – it looked pretty good too. Inspirational books like these 3, James Dyson’s “Against the Odds: An Autobiography” and Guy’s many books are important reads when you’re involved in a Start-Up…they remind you that you only win by never giving up. When we initiated our website last year, we knew that keeping it fresh might actually be more difficult than the large amount of work which went into building it. Because our content – Hollywood movie history – lends itself well to the short-story blog format, we figured that using a blog for the “current” content might be a good way to go. The thing I find most interesting about Guy’s post here is not the entrepreneurial aspects, but his “blog story” tagging system. We have just recently come to the realization that “blogging on the fly” did not fit in with the rest of our paying-job lives and the time we were putting into our anchor site. “Current news” regurgitation, which is a pretty speedy blog method, does not quite fit for us. And so we have begun our own “virtual and actual” desk-drawer system for collecting blog ideas, akin to Guy’s post-its. We’re still learning, so it was positively reinforcing to see that someone of Guy’s broad interests and publishing skills also needs something to keep the chaos of good ideas in order! One of hte key skills of a blogger is knowing what to steal! It’s “Chutzpah” not “hootspah”. It’s Yiddish not Scottish. This is a great book for entrepreneurs who has either started their company or planning to start a company. It’s definitely worth reading. Look at all the sticky notes that Guy has in the book! I just started reading this – great! The first two chapters on Max Levchin (ebay) and Sabeer Bhatia (hotmail) are insightful. Woz’s story, as told in his own words, is an ode to an egomaniac. He’s so full of himself, which is an amazing contrast to some of the other folks profiled here. Thanks for sharing this book – while I can’t identify with the success of these folks, I do intimately recognize my own pain as a start-up entrepreneur. correction: Max – paypal… sorry Max!! This is one of my favorite quotes (Marimba section of book, page 157). A few weeks later, when another senior engineer quit, I said, “Screw it, let’s go buy an espresso machine.” So Jonathan and I went online and bought this super-duper Italian, fully automatic, $15,000 espresso machine on his credit card and submitted the expense form. The CFO almost had a baby. It was unbelievable. This was a beautiful piece of work, and they came and installed the espresso machine and it was the best money ever spent. Every morning, people would meet and crowd around it. This thing was just it, the bee’s knees, people loved it, they couldn’t stop talking about it. A month later, the CFO came and said, “I’m sorry, we should have done this years ago.” And it tells you something about where you spend your money and what you spend your money on. It’s not just business-related expenses. You also have to create an environment that you like so that people are happy and feel they are valued.